Dog Tag Art pet tags are made of high-quality recycled stainless steel and are each permanently infused with full-color graphics and personalized text. They are fully customizable with pet name, phone number, and other vital information. 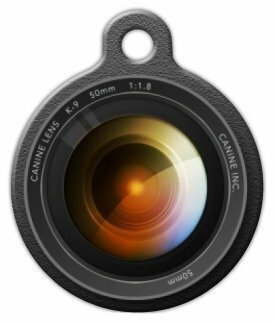 Our dog tags for pets are one-of-a-kind, extremely durable, and of the highest quality. Dog Tag Art pet tags are illustrated and designed by artists from all over the globe, and completely made in the USA. They are ultra-durable and guaranteed for life to always be legible. If the tag you purchase ever becomes unreadable we will replace it for free. Our dog tags come in two sizes: Large (1.25" diameter - about the size of a half dollar) and Small (7/8" diameter - about the size of a nickel). The small tag is best for cats and little dogs while the large size is more suitable for medium and large dogs. It is important to leave the custom information you want printed on the text side of your pet tag in the "Gift Message" field at checkout. However, if you are on a mobile device you may not have this option. In this case please message us immediately through Amazon or your shipment may be delayed. Each tag comes with 4 lines of information with no more than 20 characters on each line. If you forget to leave your custom text we will message you through Amazon. If we don't get a response within a couple days, we will send your tag with the design on both sides. IMPORTANT: Please leave your information for the back of the ID tag in the "Gift Message" field upon checkout. You may also message us through Amazon with what you would like. You get 4 lines with about 20 characters in each. Solid one-piece construction - No glued or "sandwiched" materials to wear out or fall apart. Split ring for collar attachement included with EVERY tag. Hundreds of designs - Don't like this design? We have hundreds more for you to choose from. If you have any questions about this product by Dog Tag Art, contact us by completing and submitting the form below. If you are looking for a specif part number, please include it with your message.